A 24-annulene. Click for 3D. It was a highly unexpected outcome of a nickel-catalyzed reaction and was described as a 24-annulene with an unusual 3D shape. Little attention has been paid to this molecule since its original report, but the focus has now returned! The reason is that a 24- annulene belongs formally to a class of molecule with 4n (n=6) π-electrons, and which makes it antiaromatic according to the (extended) Hückel rule. This is a select class of molecule, of which the first two members are cyclobutadiene and cyclo-octatetraene. The first of these is exceptionally reactive and unstable and is the archetypal anti-aromatic molecule. The second is not actually unstable, but it is reactive and conventional wisdom has it that it avoids the undesirable antiaromaticity by adopting a highly non-planar tub shape and hence instead adopts reactive non-aromaticity. Both these examples have localized double bonds, a great contrast with the molecule which sandwiches them, cyclo-hexatriene (i.e. benzene). The reason for the resurgent interest is that a number of crystalline, apparently stable, antiaromatic molecules have recently been discovered, and ostensibly, molecule 1 belongs to this select class! So is 1 actually anti-aromatic? Let us look at some of the ways in which this might be estimated. One can inspect the bond lengths, measured from X-ray analysis. The longest is 1.463Å, labelled a above, and it corresponds to a single bond (value from the crystal structure). If the molecule had a bond alternating structure, the adjacent bonds would be expected to be much shorter, in the region of 1.32Å. In fact, they are rather longer, at 1.37Å. Indeed, in the cycloheptatriene part of the molecule, the alternation is much less than one might expect of an anti-aromatic molecule, oscillating between 1.37 and 1.43Å. One can also inspect aromaticity via a variety of magnetic indices. The simplest of these is the NICS probe. Placed at a ring centroid, a negative value of this index of around -10ppm indicates aromaticity (this is the value for benzene), whilst a strongly positive value (of up to +20 ppm) indicates anti-aromaticity. Molecule 1 has two potential centroids, one placed at the absolute centre of the system, and one placed at the centroid of the ~6-membered ring completed using bond b (in reality, the centroids were computed from the positions of ring critical points obtained from an AIM analysis). The NICS values at these two positions are both ~-4.4 ppm (See DOI: 10042/to-2156 for details of the calculation). These values does not indicate antiaromaticity! They could even be described as mildly aromatic. So what is going on? What about the chemical shifts of the other protons? All the hydrogens attached to sp2 carbons are predicted to resonate at around 6.7ppm (unfortunately Wilke does not report the experimental spectrum), which is typical of an aromatic system (anti-aromatic systems have high upfield shifts for such protons, at around 2ppm or even -2 ppm, see DOI: 10.1021/ol703129z for examples). The two protons of the methylene bridges are also quite different; 2.9 and 0.8 ppm. The latter is the proton endo to the cycloheptatrienyl ring, and is typical of a proton placed in the anisotropic magnetic shielding region of e.g. benzene. Thus the cycloheptatrienyl ring is itself behaving as if it were aromatic, whereas the overarching 24-annulene ring is certainly not behaving as if it were antiaromatic. One possible explanation involves a concept known as homoaromaticity. The bond marked as b could be regarded as completing the 6π-electron local aromaticity of that ring (it would be formally considered as a 1π-electron bond, with no underlying σ-framework, see 10.1021/ct8001915 for further detail). Well characterised examples of such neutral homoaromatics are in fact very rare indeed; the phenomenon is thought to manifest mostly through cationic homoaromatics (i.e. the homotropylium cation, see 10.1021/jo801022b for discussion). 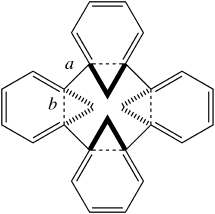 So has the case been made for 1 being the first clear cut example of a neutral homoaromatic molecule, containing no less than four rings exhibiting this type of aromaticity? There is one further concept that can be introduced. Clar (for a discussion, see DOI: 10.1021/cr0300946) proposed that benzenoid 6π-electron local aromaticity is preferred to less local or more extended cyclic conjugations, if the two compete. Many examples in a type of compound known as polybenzenoid aromatics are known where the most favourable resonance structure is that which maximises the number of Clar rings. More recently, quite a few ostensibly antiaromatic molecules have been shown to attenuate this unfavourable effect by forming instead groups of aromatic Clar islands containing delocalized benzene like rings (discussion of this point can be found at DOI: 10.1039/b810147g). In molecule 1, we could have a new phenomenon; a homoClar ring, formed to avoid antiaromaticity. For further discussion, see the comment posted to Steve Bachrach’s blog. This entry was posted on Monday, April 13th, 2009 at 4:34 pm and is filed under Interesting chemistry. You can follow any responses to this entry through the RSS 2.0 feed. You can leave a response, or trackback from your own site.